At Mathieson, Moyski, Austin & Co., LLP, a CPA firm in Wheaton, Illinois, we know that our most important asset is our people. We provide an opportunity for our accounting professionals and support staff to grow and develop in their careers, offering variety, professional development and advancement in an exceptional office environment. Our professional team is exposed to a variety of projects, including the preparation of business and individual tax returns, preparing financial statements and conducting audits of various types of entities. We serve clients ranging from business owners, manufacturers (wholesalers and distributors), real estate developers, home builders and healthcare and medical organizations to retailers, governmental agencies and non-profit organizations. Our tax services integrate tax planning along with tax preparation. We are focused on technology and work with different software applications, including Creative Solutions, QuickBooks, and various general ledger packages. 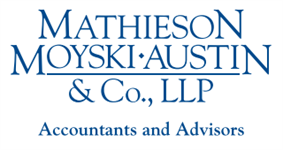 Whatever your vision for your career in public accounting, there are opportunities to grow at Mathieson, Moyski, Austin & Co., LLP. Our office is friendly and courteous and we operate in a climate of mutual respect. Client assignments are staffed using realistic timetables. Our clients are mostly local, which keeps travel to a minimum. We maintain our professionalism within a “business casual” environment, and recognize that work-life balance is important to all of our staff. Together, we work hard to meet our clients’ needs while we enjoy being part of a team. Our most important product is prompt and effective service of the highest quality, and we achieve that by making sure our staff has access to continuous learning. Employees have on-going access to our partners and managers, and we provide 40 hours of continuing professional education per year. Staff associates have direct contact with our clients, enabling them to grow both professionally and personally. At Mathieson, Moyski, Austin & Co., LLP motivation drives advancement. Promotions are based on accomplishments. We have annual salary reviews and a bonus plan based on profitability and performance. Our benefits, based on length of employment, include: competitive salaries, a SIMPLE IRA Plan, vacation, medical insurance plan, life insurance, and sick/personal time. For employment consideration, please e-mail your interest in our firm along with your resume to [email protected], or fax to 630.653.1735, or mail to Mathieson, Moyski, Austin & Co., LLP, at 211 S. Wheaton Avenue, Suite 300, Wheaton, IL, 60187.